Christmas is just hours away! I’m off from work for a few days and need to catch up on blogging. The topic for this post is about one particular Christmas decoration that is common across the country. 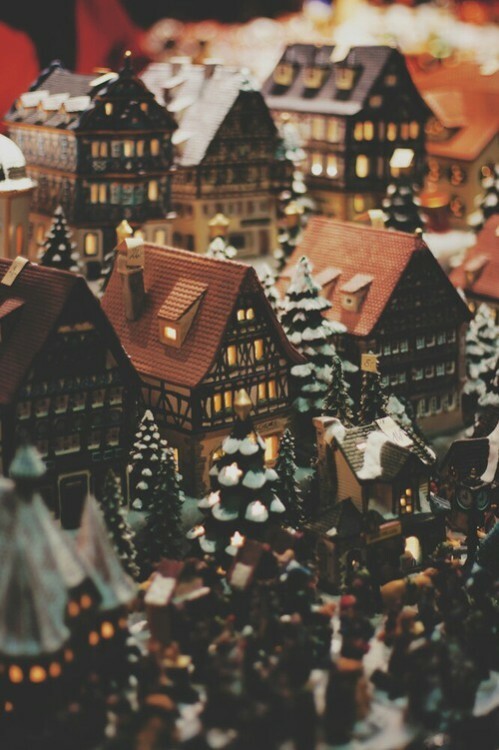 Did your family ever set up a Christmas village in their home for the holidays? Ever wonder why people do this? Of all the things that makes Christmas, what is so special about a village? I remember my mother had a little village that she started, but has yet to build on it. I don’t even think she has it anymore. It only consisted of three or four buildings. My grandmother on my dad’s side has a village that she sets up every year, but nothing too overwhelming. Her village only serves the sole purpose of being decor. I have often wondered, why do people set up Christmas villages? What is so special about them and how did this even start? I’ve done a little research and found that setting up a Christmas village is really just a fad. Would you believe it that the Christmas village tradition started with the nativity scene? It’s true! Centuries ago, people would set up their nativity scenes underneath their Christmas trees. At some point they started adding more biblical characters to their sets. David, Abraham, and eventually Noah’s ark. Then people started taking it to the next level by adding nearby villages. So there wasn’t just this town of Bethlehem, but other towns mentioned in the Bible. Of course when there’s a hot new item the only logical thing to do would be to make bank on it and one up your competitors. Which is how people transitioned their villages from a Biblical theme to a more modern theme. I find it interesting that this meaningless tradition began from the Nativity Scene. Of all the Christmas symbols, it was the Nativity Scene. It makes sense that the two would break off and become separate traditions today. Adding all those extra figures and villages would deviate from the original purpose setting up the nativity scene and it would become lost. I actually want to start making my own Christmas village and nativity scene. I probably won’t go too extravagant or overboard with my Christmas village. I don’t plan on adding more than what’s necessary with my nativity scene and I certainly won’t be conjoining the two.